Jane didn't really talk about her birthday party much during planning. But sometime this week she started saying she wanted an "everything" party. That's a really good thing because that's sort of what I was planning -- a hodge podge of decorations and low key playing with her friends. I got an email about free shipping for Halloween goodies from Oriental Trading. 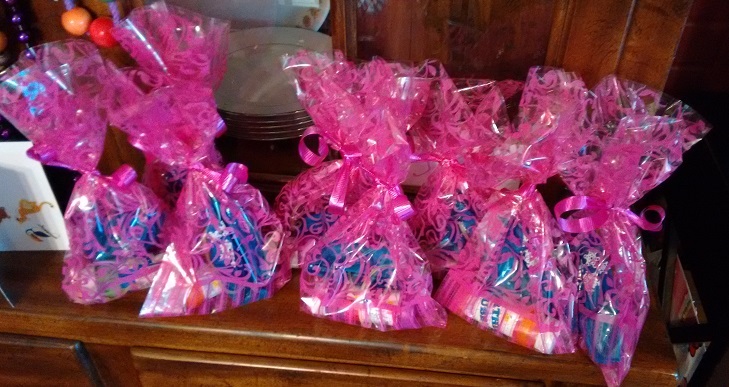 I already had my Halloween giveaways (and I have so many glow bracelets left over it's ridiculous -- thanks to super rainy weather at our church trunk-or-treat), but I did need things for Jane's party so I took advantage. I got 12 Minnie Mouse balloons, 48 blue and pink regular balloons (only one dud in the bunch), and a Doc Happy Birthday banner. 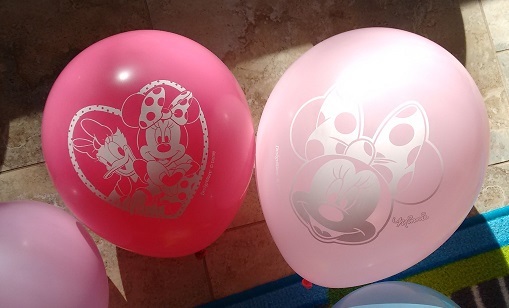 I also got blue with white snowflake punch balloons (a la Frozen) and birthday bubbles (just because) to put in pink treat bags as thank-you-for-coming-gifts. I found Hello Kitty napkins on clearance at Target (52 cents per pack! 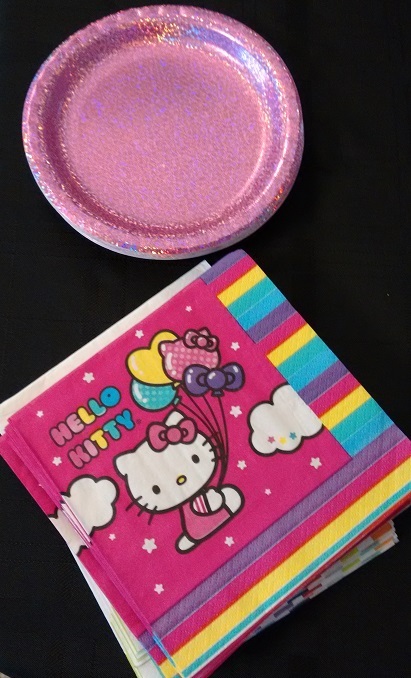 ), where I also got some sparkly pink plates. 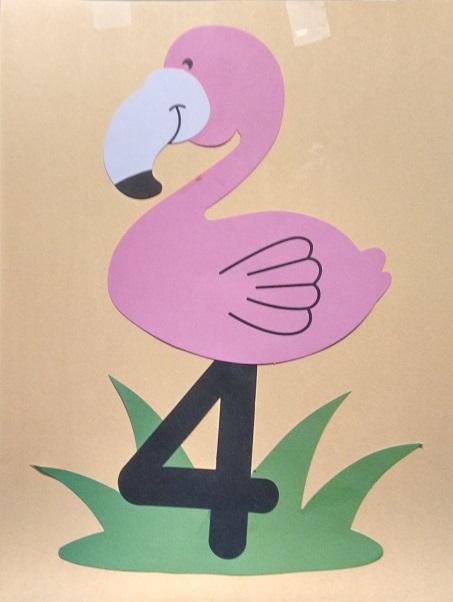 I also got a cute craft from Oriental Trading -- a flamingo with legs that look like a 4. It was pretty simple, and we used glue sticks to put it together. Arts and crafts wasn't the main focus of the party. Basically playing together with all Jane's too-many toys was the best part. We could have gone outside for bubbles and chalk, but it never seemed necessary and was just as fun to hang out inside. For food we Jane asked for "Angel Cake." 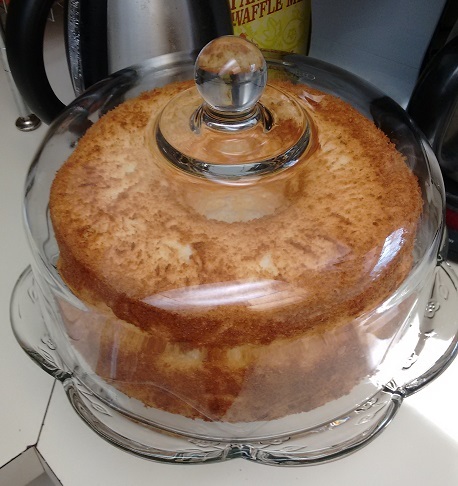 She'd never had angel food cake to my knowledge, but that's what I made. I used a box, because that's how I remember my Gran making it, but every box I found just called for adding water. And I know I remember Gran having to beat egg whites and keep the beaters and bowl completely dry. Maybe mixes have changed since then? Anyway, it came out beautifully. I sliced two packages of strawberries (out of season, but part of Jane's request) and whipped too much real whipped cream. It was delicious though, and I enjoyed using my Kitchen Aid stand mixer for that. Easy peasy. Jane was mad that I baked the cake without her, so we also made some back-up cupcakes that were equally tasty. (I also wasn't sure if kids would like angel food cake, but they did!) I made buttercream icing, and I tried to dye it with raspberry juice. I hadn't microwaved enough frozen raspberries to make a difference so the frosting just stayed white. 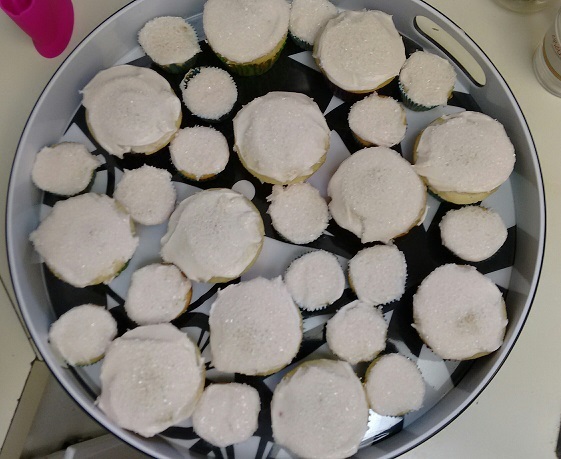 I did dip each cupcake in crystal sugar so they looked sparkly and pretty (a la Frozen). We also served strawberry and vanilla ice cream. YUM! I also served some snacks during the beginning of the party (always send the kids HOME on a sugar high, never hop them up at the beginning). 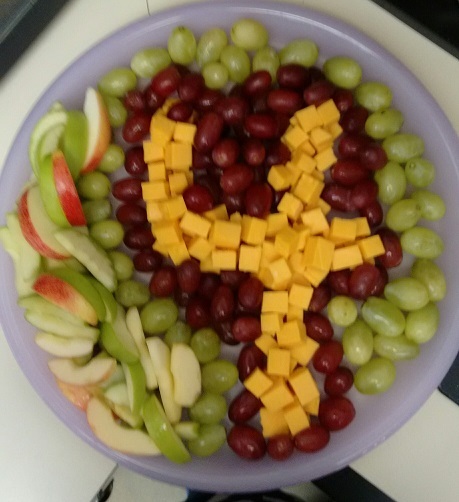 I had a flash of brilliance (at least what counts for brilliance to me these days) and decided to arrange cheese cubes in the shape of a 4 and have fruit around as the "background." Similar to the rainbow I did at Jane's second birthday party. Last year we strung balloons on a string and taped it up to the wall in the shape of a 3. This year she got cheese. It didn't last as long! 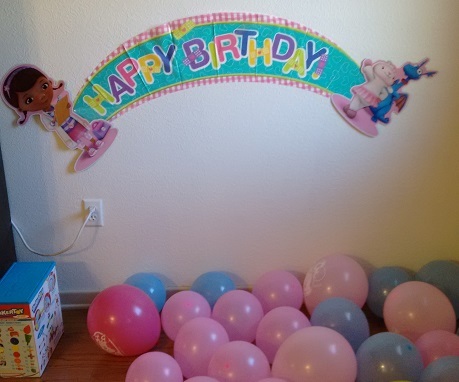 (Those 3 balloons lasted for months!) Anyway, the 4 of cheese turned out a lot cuter than I expected ... and I bought WAY too much cheese so I have three blocks left. (I realized how much cheaper it is to cube my own ... aren't I a thrifty one? Uh ...) We also had an assortment of crackers, water and lemonade. No one drank any lemonade! I got some butterfly crackers that were adorable, and I think Jane ate most of them! Jane had a great time, and she was given lovely gifts from her friends. I think the kids and parents had a nice time too. 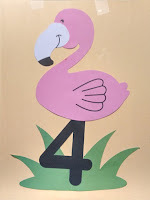 We invited four friends since she's 4 years old -- and I still stressed out about how many people were in my house at once because of siblings and parents. (Total was 7 kids, including Jane because two siblings stayed home napping, and 7 adults including me and Shawn -- 14 doesn't seem so bad I guess.) We had plenty of food, and Shawn's going to be eating ice cream and drinking lemonade for a while! I am exhausted, as I stood up a lot more than I'm used to (should start standing more as a rule!) and the pre-game prep and post-game cleaning were draining. But everything's back in order, we have 50+ balloons still hanging around so the celebration will continue for a while longer. I love my big 4-year-old Jane, so the whole thing was worth it.